1) No new purchases! I have found that a lot of clients would rather go out and buy a new item then have to look for it in their own home. So in order to reduce the amount of money spent I ask if they will hold off on purchasing until we have finished sorting because we might actually end up finding exactly what they are looking for. I have filled entire shelves with adhesive tape because clients will go out and buy new tape without looking for it first. Paper, writing utensils, and organizing products have all fallen under this category of “ITEMS I NEED NOW” when there were plenty in the home already. 2 ) Sort. As you begin to sort put like items together. This makes it easier to know what you have, how much you have of it, and where it could be stored later. During the sorting process I also try to understand exaclty what the crafter really needs in terms of organizational management. For example, if they have a lot of magazines like in the above picture, do they really need to have them categorized by Magazine or by Categoray, or even if they just need to review and throw out. 3) Categorize and Create Stations. 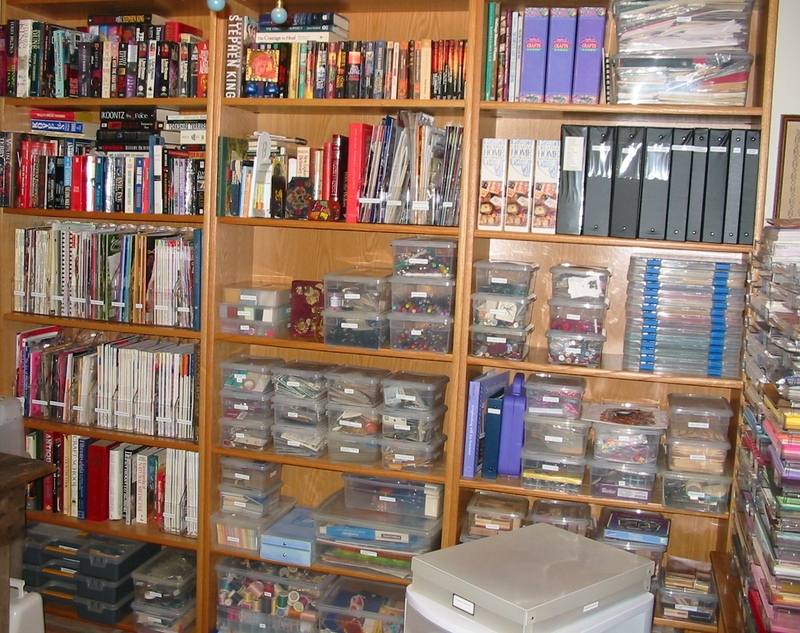 Generally I do this at the same time as sorting but I also begin to plan the space, where everything will he stored and how it will be stored. This might be limited in terms of space or budget so begin to take that into account as well. 4) Store. Now that you know what you have, you can store it in appropriate containers. I love clear stackable containers with lids. I also love repurposing items that might otherwise be trashed. 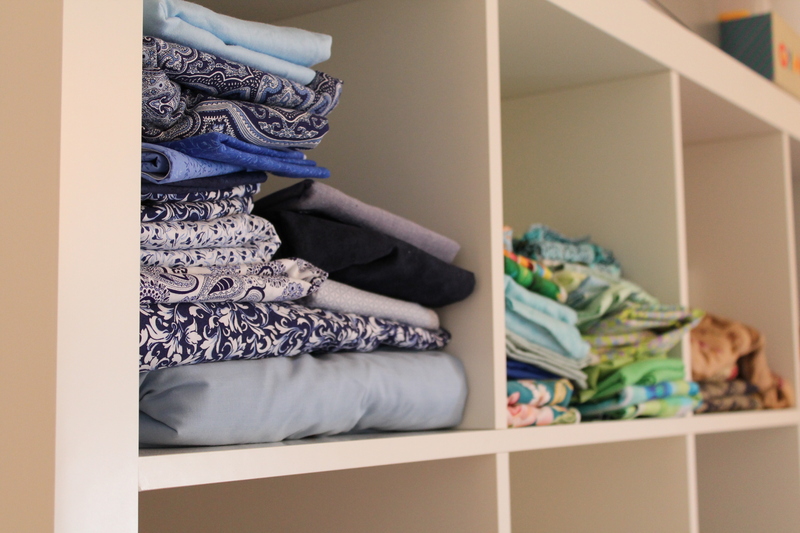 Clothing boxes, gift bags, and sweater bags from the dry cleaners all make excellent craft containers. 5) Visual Organization. Make it easy for you to know what you have and know where you have it, Label! 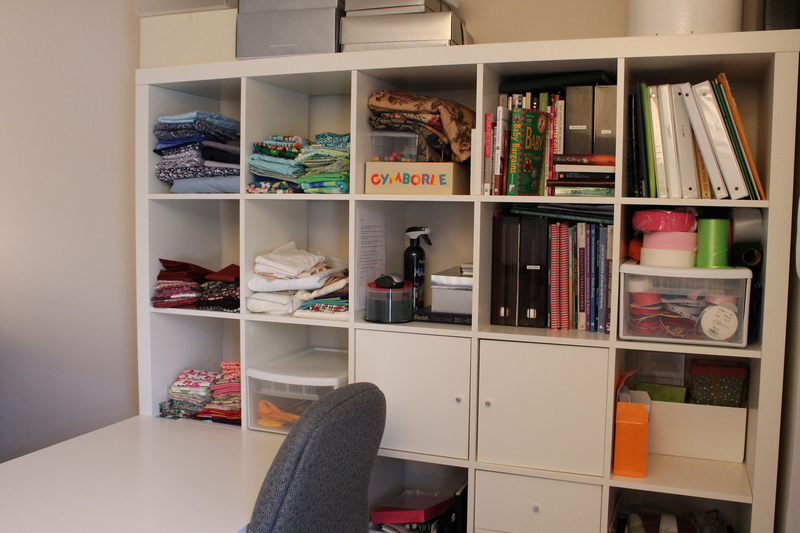 Please comment if you have something that just doesn’t seem to fit or if you need help organizing your craft space. This entry was posted in Crafts, Organizing: Space and tagged Craft Organization, craft organizing, crafting, crafts, fabric storage, organize, organizing on February 1, 2013 by Organizational Specialist. Thank you! I just love organizing crafts because not only is the client inspired but I feel like I learn a new craft every time. Wow! That’s a huge craft room and lots of items. It looks great! Thank you! Craft rooms are always fun! We just deconstructed Mom’s craft room yesterday and it’s inspiring me to straighten out my closet. 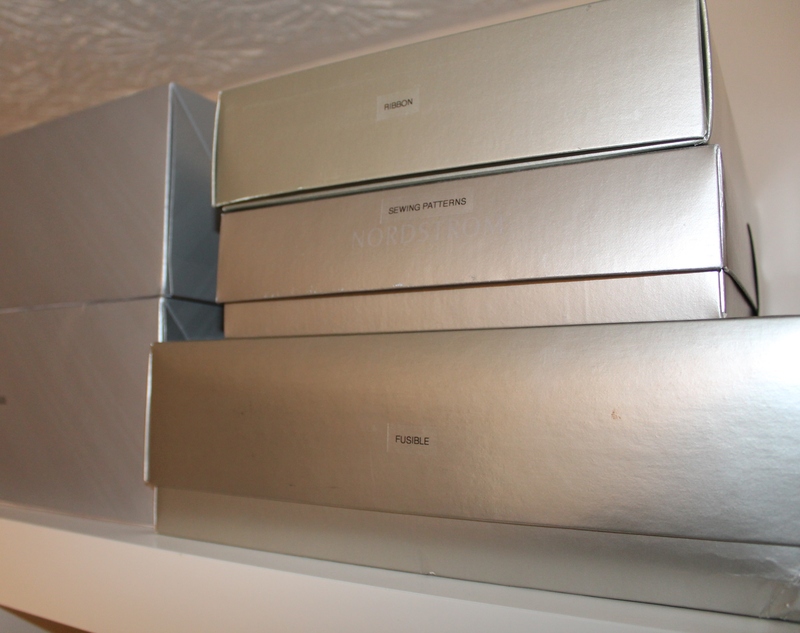 Love your neatly arranged and labeled Nordstrom boxes. Great organizers. I need to shop there more often to get them. Yet, your advice on no new purchases is the key for me! Those boxes are the perfect size for so many applications! So exciting to be planning a new space! 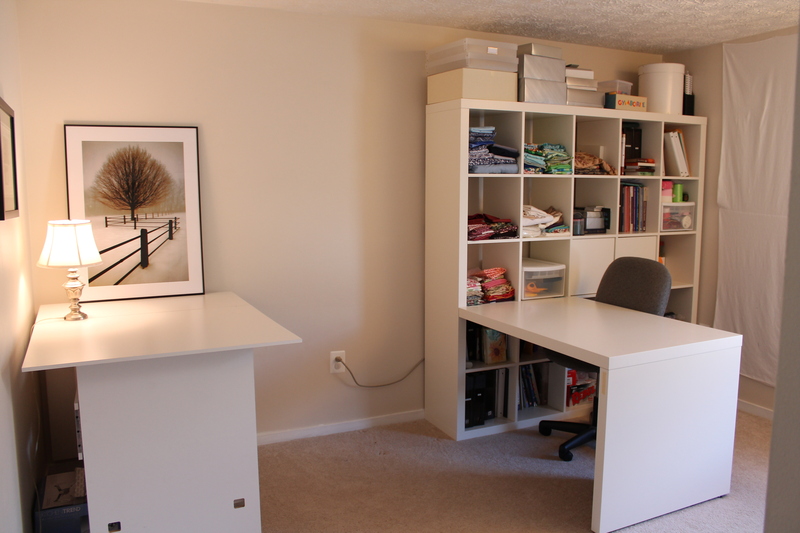 If you can try and create two work stations, however if that’s not possible then have a place to store individual active projects. I love the Expedit from Ikea (as shown above) because of its versatility and use of vertical space. Making sure to have designated spaces for shared items is key, meaning label where items go so you aren’t constantly searching for scissors, tape, glue, etc. Hope that helps and look forward to seeing pictures! I’m hopeless. I do a lot of quilting and art and need an extra guestroom combined. I have two barrister bookcases with 4 shelves in each. They hold my fabric; most of it. My closet is stuffed with other art items for painting and sewing and patterns. I have too many sewing patterns. I’m starting to use the older ones in my artwork as well. I think I just need a storage room. I literally can’t do any of my art and quilting due to the space that is being used just for storage of the art supplies and fabrics. I need baby steps and extra arms and legs as I also have physical disabilities. oh well, I will make it. This is a start and I will look at rooms to get me enthused about it. I have started to just walk into the room and look at it and walk out. That is not good for my art which I need to produce and sell. Don’t stop creating! I’ve seen this many times, you have the supplies but can’t find the space to create! You have the right idea, take baby steps. Remove the items that you know you can donate, clear off the workspace one box at a time, and begin using up your craft stash. You may really benefit from hiring a professional to help, http://www.napo.net. Good luck and I would love for you to share your progress!